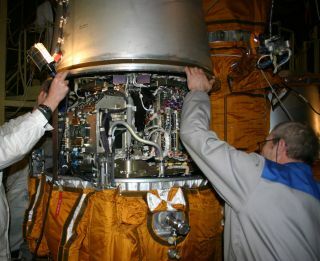 The PAMELA instrument to detect cosmic rays is installed on its satellite. A longstanding question in astronomy is what creates cosmic rays, the super-speedy space particles that can zip right through the Earth. The reigning explanation for cosmic rays has been that protons and other particles are accelerated by the leftovers of supernovas – the powerful explosions that occur when huge stars die. But new observations from Italy's space-based PAMELA cosmic ray detector appear to contradict that scenario and have researchers digging for a new explanation. "Now we don’t know how cosmic rays are accelerated in space," said astronomer Piergiorgio Picozza of Italy's National Institute of Nuclear Physics and the University of Rome. "Before our data, it seems that the paradigm is supernova remnants. Now we have to think of some refinement of this paradigm, or we need to find some other possibility." Picozza is the principal investigator for PAMELA and co-author of a paper announcing the results in the March 4 issue of the journal Science. Before giant stars die in explosive convulsions, they shed their outer gas layers. These are left behind after the star explodes and becomes a dense neutron star or a black hole. These particles then fly through space. Many are bombarding Earth at this very moment. Italy's PAMELA instrument (PAMELA stands for "Payload for Antimatter Matter Exploration and Light-nuclei Astrophysics") orbits the Earth on the Russian Resurs-DK1 satellite. The instrument, launched in 2006, detects cosmic ray particles such as protons and helium nuclei, as well as boron and carbon nuclei, using a magnetic spectrometer that can measure the abundance of particles of different energies. PAMELA's high-precision observations are suggesting that the abundance of cosmic ray particles – their flux – as a function of their energy varies depending on the type of particle. That is, the relationship between flux and energy is different for protons than for helium nuclei. That result is unexpected. If all the particles were accelerated by the same supernova remnant, they should follow the same law. "There is not any reason for nuclei to be accelerated in a different way," Picozza told SPACE.com. The difference is so small that most experiments would be unlikely to notice it, Picozza added. The findings do seem to fit, however, with some other recent findings, such as observations of strange gamma-ray flares from a supernova remnant called the Crab Nebula, seen by the Italian Space Agency's AGILE and NASA's Fermi satellites. Picozza said the new PAMELA data – which are extremely precise and robust – are likely to prompt a rewrite of the leading cosmic ray model. "I think these results are really very important because they mean we need more-sophisticated processes to accelerate the cosmic rays," Picozza said. "Our results, combined with the results of AGILE and Fermi,can change the way to think about the possibility of acceleration." Picozza said it was too soon to suggest an alternative to the prevailing theory, but predicted that astronomy papers proposing new solutions would be posted by next week to the astronomy pre-print website ArXiv, where researchers' findings can be shared while they are still undergoing peer review, before publication. "In my knowledge there is not some clear hypothesis about this yet," Picozza said. "There will be many papers, and many ideas will be developed and some solution will be found."